Sochi Winter Olympics and Georgia: A New Beginning? As the 2014 Winter Olympics in Sochi approach, the issue of security is increasingly in the spotlight. Already there has been an increase in cooperation between Russia and its Western partners to better secure the Games. On the regional level, however, it remains unclear to what extent, if any, Russia will cooperate with neighboring Georgia, a country that it has long accused of covertly contributing to insecurity and violence in the turbulent Northern Caucasus region. With the Games less than three months away, Britain’s MI6 announced on November 7 its intention to share the experience it gained from the 2012 Summer Olympics in London with Russia. Such a decision is in the spirit of maintaining positive relations ahead of major international sporting competitions and is part of a growing trend within the international community in combating terrorism. Georgia certainly does not have the experience of hosting such a massive event, but its security and intelligence forces could nevertheless influence the conduct and outcome of the Games. There are even some pundits who predict that some in the current or former Georgian government may even try to use the occasion of the Winter Olympics as a forum for political debate by staging a range of destabilizing events. The difficult neighborhood, and in the aftermath of the brief Georgian-Russian war in 2008 makes such cooperation all the more important. Sochi is located on the western edge of the Northern Caucasus region, Russia’s southernmost border. The region takes its name from a formidable mountain range that separates the former Soviet republics of Georgia, Azerbaijan and Armenia to the south. Sochi’s pick as the host of the games on July 4, 2007 immediately raised eyebrows among many security experts due to the city’s proximity to this region of the Russian Federation, which for over the past two decades has seen bloody secessionist movements that have created long lasting security implications. Two major wars erupted in Chechnya in the 1990s leading into the mid 2000s, resulting in the emergence of Islamic fundamentalism, especially in Chechnya and neighboring Dagestan, and ensuing low level violence and crime that continue to plague the region, inter alia. Though not officially located in the Northern Caucasus region, and with a relatively small Muslim population, Krasnodar Krai with its capital Sochi, fall within the so-called Caucasus Emirate, a virtual state proclaimed by its “Emir”, Chechen militant and alleged terrorist mastermind Dokka Umarov in 2007. Georgia and Chechen rebels: What is the nexus? As Russian security forces were struggling to deal with pockets of resistance and acts of terrorism in or emanating from the region, Moscow continued to link Georgia to its security troubles at home. This was partly due to Georgia’s track record as a weapons and drugs smuggling corridor, but also because the country provided a safe haven for Chechen rebels in its Pankisi Gorge during the height of renewed Russian-Chechen hostilities. Nearly ten years into the second Chechen War, in 2010, Aleksander Bastrykin, head of Russia’s Investigative Committee would describe the situation in the Northern Caucasus as equivalent to an all-out war, explaining that militants were killing between five and six Russian Interior Ministry troops per day. In late 2009, Aleksander Bortnikov, the director of Russia’s Federal Security Service (FSB) said that he was in possession of audio evidence seized from insurgents that showed that they had close contact with representatives of Georgian special services along with “emissaries of Al-Qaeda”. The FSB chief alleged that through these links, Georgia “participated in training of terrorists and facilitating their movement to Chechnya”. In October 2010, Ramzan Kadyrov, Moscow’s strongman in Chechnya, told Russian news stations that Georgia played an exclusive role in fueling the insurgency, claiming that entire rebel contingents received financial and material support via Georgian territory. Keep in mind that Sochi, a seaside resort, is also located just north of Abkhazia, a Georgian breakaway region, which along with South Ossetia, was recognized as an independent state by Moscow following the 2008 Georgia-Russia War. Relations between Tbilisi and Moscow had already been steadily deteriorating since the pro-Western Georgian President Mikhail Saakashvili came to power and hastily sought to integrate his country into Western economic and military structures. These policies were implemented at the expense of relations with Russia, and likewise, delicate peace prospects with the breakaway regions were further set back, especially given the influence Moscow enjoyed in these separatist regions since gaining de-facto independence from Georgia in the wake of the Soviet Union’s collapse. Against huge odds, the Georgian government found itself still in power after its country’s defeat in the 2008 war (perhaps based on the Saddam Hussein model circa the First Persian Gulf War), and soon began to step up its anti-Russian rhetoric, likely believing that if it had survived a Russian counterattack, it could now get away with just about anything. As part of this often reckless subterfuge, Tbilisi jumped on an opportunity to discredit Russia for hosting the 2014 Winter Olympics. On May 20, 2011, the Georgian Parliament unanimously recognized the controversial Circassian Genocide, the mid-nineteenth century massacres and expulsion of ethnic Circassians (native to the Sochi area) following Imperial Russia’s conquest of the Caucasus after nearly a century of war. Despite its official backing by the Georgian authorities, who called the Circassians their brothers, the recognition received a largely negative response. Many prominent Circassians and local organizations viewed the decision as less than wholehearted, and as a cheap ploy to score political points by playing into sensitive ethno-historical issues. Nevertheless, under Saakashvili’s presidency, the Georgian authorities continued to portray Russia as a villain at nearly every opportunity. The hosting of the Winter Olympics on the site of historical atrocities seemed to conveniently fit into this policy even in spite of the limited fanfare among key stakeholders. Meanwhile, many Georgians were encouraged to believe that their team’s participation in the Games would be tantamount to betraying their country given Russia’s support to Abkhazia and South Ossetia. For Georgia, there would be little to gain in boycotting the Olympics. Lacking the umbrella of a coordinated multinational boycott, such as the US-backed decision not to participate in the 1980 Moscow Summer Olympics over the Soviet invasion of Afghanistan, Tbilisi’s decision would come off as rooted in its sourness over its lose in the 2008 war. Moreover, the move could invite retaliation from Russia, likely in its most subtle form, such as a reactivation of Moscow’s PR campaign to tie Georgia to the insurgency in Chechnya and elsewhere (renewed allegations of such a nexus would be especially damaging in the event of a terrorist attack at the Games). Russia could just as easily choose to further showcase and augment its relations with neighboring Abkhazia, it protectorate. It could take the opportunity to portray itself as the nation which protected Abkhazia from “Georgian aggression” and which subsequently took the lead in recognizing a people’s right to self-determination. 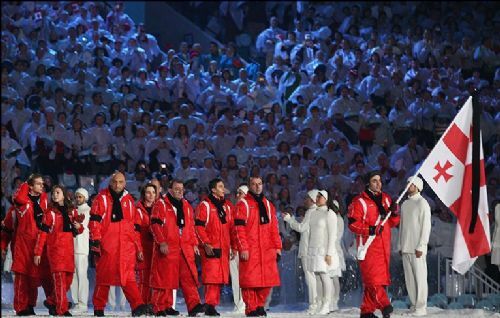 Under the Games’ international spotlight, a boycott or even a refusal to cooperate with Russian security or intelligence services in contributing to the Games’ security would be to the detriment of Georgia’s image. Moreover, it could significantly hamper Tbilisi’s efforts at home to continue justifying the need to improve ties with Moscow. But with the change of Georgia’s government in the October 2012 Parliamentary elections, which saw Saakashviili’s United National Movement lose to Bidzina Ivanisvhili’s Georgian Dream coalition, Tbilisi has since successfully worked with Moscow to restore trade ties, albeit on a limited scale, and restore links in humanitarian and cultural spheres. Still, the controversy over Georgia’s participation in the Winter Olympics resurfaced when a Russian air force pilot who ran combat sorties over Georgia during the 2008 war was chosen to take part in the Olympic torch bearing relay around the Kremlin. However, the election of Georgian Dream candidate Giorgi Margvelashvili in Georgia’s recent October 27 Presidential Elections put an end to the need to accommodate/cohabitate with Georgia’s remaining anti-Russian hardliners, thereby helping to shift the discussion from whether Georgia’s national team should participate in the Games to whether the Georgian president should attend the event. In a interview with Russia’ First Channel on November 11, the incoming president said that the issue of his attendance is being considered by his team, adding that the Olympic Games represent “a good start” in avoiding political tensions and could help to foster “new relationships.” Ideally, Moscow would like to see the Georgian-Russian relationship expand beyond the trade and cultural links to collaboration in the security and intelligence realm, with the Sochi Games serving as the perfect platform. The months leading up to the Sochi Winter Olympics will be a litmus test for gauging the ability of Russia and Georgia to further build on existing progress in restoring bilateral relations. In the context of the Games, the timely change in Georgia’s leadership signifies the neutralization of Georgia’s anti-Russian rhetoric in one of the most sensitive areas, while also provides Moscow an opportunity to make a hard-to-resist “request” to Tbilisi to cooperate in the security area, which can be seen as part of a broader effort to make further inroads into Georgia’s security and intelligence apparatus and ensure continuity during Georgia’s political transition. Given the security challenges in the Northern Caucasus and during a time of heightened geopolitical tensions over Georgia and other post-Soviet states involving competing trade blocs touted by the European Union and Russia, it is especially important for Moscow to use the Olympics as a venue for improving trade, political relations and anti-terrorism cooperation. Ian Carver, communications specialist and freelance journalist, that has worked extensively in the Caucasus, the Middle East and Central Asia, exclusively for the online magazine “New Eastern Outlook”.